I'm very interested in either finding (if someone has already done this) or creating a model of comprehensive human health. My basic thesis is that there are three components to overall health (or "the good life") - body, mind, & spirit. In each of these components you'll have various sub-categories. For example, body would have things like food, sleep, exercise, medical, environment, etc as sub-categories. These sub-categories may have multiple levels of sub-categories of their own. Let's call each element a node. My conceptual framework right now is that these nodes can be mapped out into an interconnected network. Each "end-point" node (i.e. it has no sub-nodes of its own) can then have quantifiable metrics associated with it. The connections between the nodes will have varying strenghts of connection (one can think of this as how distant the nodes are from each-other). For example, your sleep might affect your mind through your mood quite strongly, but perhaps have a very marginal effect on your spirit through your sense of meaning in life. The ultimate goal of the project would be to come up with a series of end-point nodes, where we have some sort of quantifiable measure that we can manipulate, that would then allow us to pinpoint the things that would have most effect on our overall health. I would like help with both brainstorming, and starting to generate the model. It's a vast project and the main difficulty I see currently is coming up with the appropriate end-point nodes & measurements - i.e. what are the things we want to measure? How do we measure them? What kind of point-values do we assign for things? Anywho - reply below if you know someone who is already working on this, or if you're interested in working on this with me. One shortcoming of their model is that it isn't very personalized, i.e. it doesn't take into account that you may need more sleep or less sleep than the average person, or need to pay more attention or less attention to your nutrition (e.g. because genetics). Thanks for the link. I checked it out and it still seems very capable but incomplete to me because it's mostly focused on exercise, sleep, how you feel on a more or less real-time basis. I could see this working in conjunction with what I'm envisioning, which is more of a quantified mapping of all the forces that shape your life. In finance terms, think of a balance sheet - gets compiled every so often, shows how everything stands at the moment. I'm not interested in tracking how many steps you took today - there's apps for that. I'm more interested in assessing your fitness level, finding the connections to various parts of your life, and then providing insight on which areas of your life would yield the most improvement to your overall quality of life. In my mind there should be a qualitative assessment that's numerical (i.e. on a scale of 1-10...) for most if not all aspects of health. If you get 8 hours of sleep but you feel like crap, but on 6 hours you feel great, then you goal should be 6 hours. I'm definitely much more interested in outcomes than prescribing how things "should be". Everyone is different. In response to your first thoughts, I would add emotion to mind, body, and spirit. I think this provides a finer tuning of awareness. We've all had our emotions lead us astray, disconnected from thought (mind) or spiritual sensibility. The distinction helps me understand, for example, what my mind does during meditation. While attending to the breath, I become aware of "telling stories", moving from place to place. This is sometimes called "monkey mind" by practitioners. While it's common to go to judgment and be sad/angry/anxious/gleeful upon noting this movement of the mind, those emotional responses are distinct from the provoking thoughts. Fascinating stuff. I'd be glad to tag along as you build out this QS model. Love this idea - I've been thinking about something very similar but including emotion also. I've been working on the 'Daily Practice' model from James Altucher (physical, mental, emotional & spiritual) over the last 2-3 years and have had massive changes in my life. Quantifying that is something I'm very interested in. - Emotional - mood trackers just coming out like moodscope. - Spiritual - meditation trackers, online gratitude journals, progress on 'purpose' goals on say trello or some other goal tracking software. I think of emotion as a subset of mental, which is composed of intellectual ("thinking"), emotional ("feeling"), habitual ("doing"). Emotion is definitely a huge part by itself - for most people it's the strongest force in their life, so it could make sense to separate it out by itself. My current work is focusing on mapping out the physical endpoints (this seems the easiest) that we can quantify & track. The next step from there is to map out the activities that most directly affect each endpoint. My other thought at the moment is to just start putting down a list of activities that have positive effects on physical wellbeing, and another list that has negative effects on physical wellbeing. Then map the activities to each measurable endpoint (i.e. work from activity to the measurable, instead of mapping out the measurables first and trying to come up with the activities from there). Just a different approach. I like your input on how to track things Justin. Seems you have a good knowledge base there, which I do not. I'll try to put together the list of physical endpoints / activities in the next week or so and post it for review. Then we can see what's feasible to track & how to best accomplish it. I did a lot of research with Aurametrix, connecting the dots between many environmental variables such as food we eat, air we breathe, things we touch, physical activity, genome and microbiome. I am sure there are lots of academic projects tackling various aspects of your problem. What are business goals? Bit late to this discussion, but it's an interesting one. Thanks for starting it, and getting it going. Quite a few years ago, I was behind the original work at Moodscope—and have continued working in mood and wellbeing tracking since then. One contribution I can make to this thread, though, is to share a physical health inventory a friend (a health expert) and I devised in 2011. It was an effort to make a kind of "pre-flight check" that would enable a non-specialist to quickly go through their physiology to rate how they were doing. The thought was that it would produce a simple, single overall score so you could track health over time, as I did with Moodscope. Beyond using it myself for an n=1 study on my whisker growth (yup, true), it's never been used. But I share it for the purposes of, perhaps, getting others thinking. Thanks again for a fascinating discussion! I think about this topic often. Currently, a major problem is that we don't have a very good understanding of what it means to be well at the level of the individual and how to measure it. Lee Hood tried to do a large study to investigate this, but it didn't get funded. Hopefully we will learn more with the PMI. A model of human health would take in body, mind and spirit but spirit is outside of the material realm. You cite for the body "things like food, sleep, exercise, medical, environment, etc" Sure food, sleep, exercise and environment are important but the all important reality that I have found is the understanding that disease is no less than a nocebo effect. Ideas, which one may cunningly be persuaded to believe, become critical components of disease. The reason is because the person reacts to those ideas and that reaction involves bodily reactivity. These may include emotions and coping habits but also a host of other reactions in the body. For example if a person can be persuaded (usually using a concealed threat) that something they have touched or eaten is toxic, then they will ignite an immune response. That response is of course unnecessary and does damage, causes a rash or indigestion etc. I have seen that cancer, diabetes, heart disease, stokes, autoimmune diseases and possibly all mental disorders are nothing more than nocebo effects. However I saw some evidence that made me think that maybe all disease, including congenital diseases are also nocebo effects. The evidence I saw regarded a man in his 30s who had been born with a heavy scaly skin. I saw him at a Chinese herbalist's waiting room where I had gone for treatment. After a few months I had changed the time that I visited the herbalist so for the next 6 months I did not see him any more. Then one day I reverted back to my old appointment day. I saw him again but at first I did not recognize him. I looked at him wondering where I had seen him before. Then he came and sat next to me and said "you don't remember me". I said no but I told him I thought I knew him. He laughed. He said you remember me with the scaly skin. I looked at him anew and with great wonder because his skin was clean and smooth. I doubt that the Chinese herbs in themselves are the answer. I would say that this man had been able to overcome some nocebo effect that was created when he was still unborn. Body-mind cannot be separated. They are one system. They are the embodiment of a spiritual/conscious being, which enables that being to have conscious physical experiences. IMO health is a condition of the body-mind, where at the least condition, personal self is at peace. Personal self is the erroneous identification of conscious self with the activities of mind and with the body. In spiritual awakening the conscious/ spiritual being is awakened to its own identity and aware that the body mind is only an embodiment. However this is still not enough to ensure health because my guru, who was undoubtedly enlightened, was killed by cancer. And I too suffered several cancer episodes, which I was able to overcome but they all came after my own enlightenment experience and NDE experience, which left me fearless of death. It is of great importance to understand the activities of toxic people and how they seek to betray others within relationship and thereby cause those people to react adversely as to suffer disease conditions, i.e., a nocebo effect. Since I have been able to understand their methods I have had no illnesses, no nocebo effects. Two Show&Tell talks come to mind that touch on this. One is Justin Timmer and his tracking of 40 variables for a year (I think). It was this image that triggered the memory, where he maps out how some of these components are related to one another. Thanks Steven for sharing my comprehensive web of my life! What I have created on that picture is just a web of correlations and not really a model. If you want to have a model on health you might want to perform a regression analyses with all the variables you (want to) collect. I have already done this but than based on my happiness. 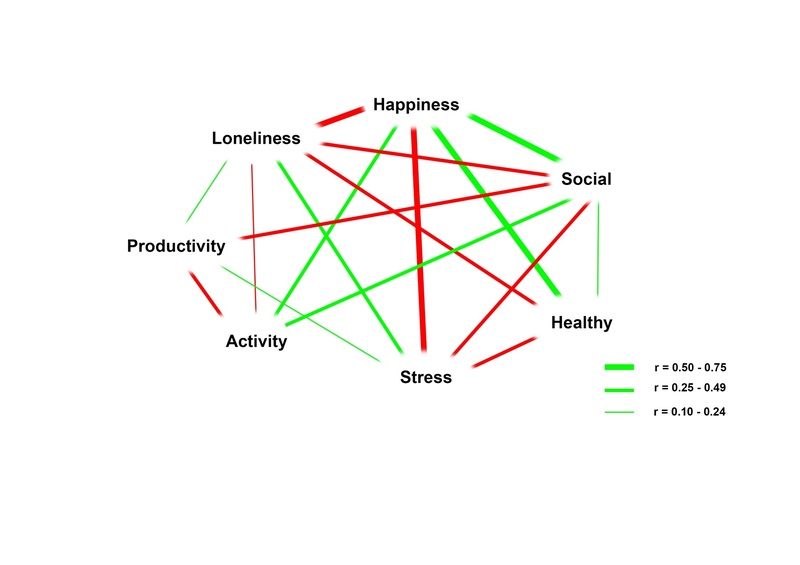 So which factors explain my happiness? You can find my blog about it here. There are many things you need to consider though when you want to analyze your health with a model, like what is your outcome variable? How do you rate your health exactly? I would be happy to work with you. It was great that Lee et al. started Arivale the more companies in the personalized wellness space the better. That being said, it is not the same as the 100k subject study he proposed. We need both. Hopefully we get what he proposed via the PMI. If I am incorrect on this I am very interested in a detailed explanation as to how Arivale and the proposed 100k study aim to achieve that same thing. Emotions are included in the phenome. They are linked to production of hormones and neurotransmitters which can be measured, and so good and bad emotions can be measured. A simple example are stress hormones. As for the genome, it is very important in creating emotions and well-being , because as an example, our genome codes how fast each of us reacts to a stressful situation, how much hormones we produce, calm people will react and produce less consistently and that calmness is coded in their genes. Yet the foods we eat and what we are exposed too or our activities (like meditation) can modulate that as well and even change the pattern of gene expression (that's part of the nature vs nurture debate). Please, please be very very cautious making statements like this as this can be really offending and hurtful to people who actually have cancer or some genetic disease. Basically you are telling them they are unnecessary ill/dying and it's their own doing. Furthermore, I can't really believe this would be a serious claim to make (illness is nocebo) with all we know about illnesses, medicin etc. Sure, your mind plays a role, but the notion that it controls everything is just some weird leftover of the believe and idea that one can control, influence and determine their own wellbeing a 100%. Also, please don't forget placebo ('feeling' better) can be dangerous as well as is shown in studies where people with asthma for instance would take less medication because they felt better. The thing is, they aren't really better and long capacity was shrinking and their wellbeing was getting worse despite 'feeling' better. Although I agree that the statement goes too far. I believe that many chronic diseases are built up from a lifetime of stress and behaviors. Also a change in lifestyle seems to be implicated in cancer remissions and similar results. We do not know the mechanisms, but many "strange" results occur. This whole area needs to be examine with proper data from lots of people. Unfortunately pre conceived notions and financial interests from Pharma and Surgeries make this very difficult. Would be interested in any research that's beyond anecdotal for those remissions 'because of lifestyle changes', could you point me to some? I know at least for sure a lot of such cases will be 'explained' by some correlating changes/actions while of course correlation is no causation..
Heard an interview with a Dutch olympic swimmer who had cancer and survived only to win gold at the olympics afterwards. His story? Luck. He was in the same program and room as others who kept fighting and training and doing everything they could. He didn't and instead he gave up. Some of those other people died fighting while he (remarkably) recovered and went on to win the olympics. He hates it how everyone asks him about 'beating cancer', as it implies some causation and power to influence his situation while he clearly felt he didn't. Now if we talk things more 'vague' like chronic fatigue syndrom or burn out or much of those chronic diseases AND if you are talking about stress in a broad manner (including physiological stress) then of course I would agree. Myself being a (chronic) migraine and daily headache patient have been looking for factors and influencers basically all my life. And even though you can pinpoint stress as a trigger and some other things like bright lights, alcohol etc., in the end you still have to deal with your genes and there will be migraines that occur seemingly 'out of nowhere', without any clear trigger. I apologise if this is going (too far) off topic..
Ah yes of course, but that's research on a different topic isn't it? Stating people are more likely to get some illness due to stress/behaviour/experiences etc. is one thing. (and I would say well established). Stating illness is nocebo is something completely different though, as we're not just talking about becoming ill, but the illness itself.